Allergic reactions to foreign proteins are common, and such reactions may come in many forms. Allergies against food proteins can be very severe. Allergies against certain food proteins, f.ex. 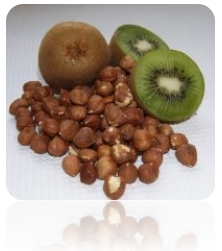 from nuts or kiwi fruit, are quite common. Nut allergy is known to be exceptionally dangerous. A wide range of proteins can cause milder allergies, and cause long-lasting discomfort. This can lead to so-called "diffuse" conditions which are difficult to diagnose. Neurozym's urine analysis does not detect allergies. Allergic reactions to food proteins can be divided into two reaction patterns: IgE and non-IgE food intolerance. IgE based food intolerance is also called atopic allergy, and is initiated by proteins and which trigger rapid formation of IgE. This immediately starts the allergic reaction which may come within minutes, typical examples being uricaria and asthma attacks. In non-IgE food intolerance the reaction is triggered by lymphocytes which are activated by food peptides and f.ex. attack the mucosal surfaces. This type of reaction comes hours or days after food intake. The gut inflammation found in many autistic children belongs to the non IgE group. In both types it's important to remove the protein in question from the diet, and it might be beneficial to use probiotics. Neurozym's own probiotic Probiozym, consists of bacteria which can break down peptides and may at the same time normalize the gut flora.